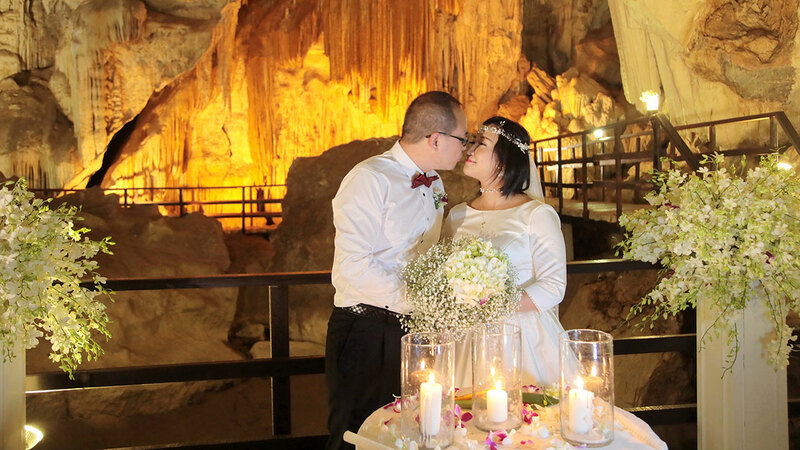 Package Overview : Diamond Cave Secular Western Ceremony Marriage Promotion Package @ Railay Bay, Krabi @ Thailand Marriage Planner and Organizer. Imagine walking down the aisle under stalactites and stalagmites, surrounded by nature, your friends and family. The Diamond Cave at Railay Bay : Krabi, Thailand is a naturally romantic location to unite with the love of your life. Diamond Cave (Tham Phra Nang Nai) is a quite large cave located at the foot of the limestone cliff separating Railay peninsula from Krabi inland. Accessible from Railay West and Railay East, it doesn't take long to get there and lights and a wooden walkway have been installed inside. Belonging to Nopparat Thara Beach – Phi Phi Island National Park, this cave features bats, a very high roof, stalactites, stalagmites and is a true wonder of nature. Reaching the end of the walkway doesn’t take a too long time as the succession of caves is about one hundred metres. It offers a cool shelter from the outside heat and the rather spectacular rock formation are great photo opportunities.